If the pile is not organised there is a danger of confidential or secure documents being lost in the pile and data breaches can occur if gotten into the wrong hands. The dread comes from knowing you need to deal with it, but not necessarily knowing exactly how to deal with the quantity and feeling overwhelmed by what feels like an enormous task. A single piece of paper is easy to deal with but this post is more to deal with when a pile has accumulated into clutter stack. Knowing and separating your confidential documents is a starting point. View our What to Shred list and see what documents can contain sensitive data. Actions such as: (1) bin it right away; (2) delegate it to someone else; (3) file it for future reference (meaning no action is currently needed with this paper); or (4) keep it to take some type of action on. Examples of papers that come into your office that require you to take action include invoices, tax forms, bank statements etc. This type of confidential paper is often left aside to be worked or filled in at a later stage, creating a “to do pile.” The longer this pile is left to accumulate the bigger the pile becomes creating more stress and clutter. While also being a security risk as a data breach could occur if these documents came into the wrong hands. Adopting a “Clean Desk Policy” is a good step to deal with clutter and prevent piles from building. Working on documents on a daily basis is a good first step. Do a little everyday will be a lot in the long run. The daily routine will become a weekly routine. When you combine the daily and weekly routines together the total system for paper organisation will be complete. The weekly paperwork session is not complicated. First, choose a day that suits your schedule. Doesn’t matter what time or day you choose as long as you do it consistently. Once you’ve decided on the day, all you do is grab the stack of paperwork that has accumulated over the course of the week on the day you’ve chosen, and now you sit down and tackle it, one piece of paper at a time. Do the paper work in batches. Deal with enough confidential documents that reduces the pile. It is still business as usual when dealing with the pile, paper is still going to be added but again as long as the pile is getting smaller than bigger is what we desire. Reconcile your bank account, confirming what checks cleared during the past week and that all deposits are credited to the account, etc. Make any necessary money transfers between bank accounts. Confirm everything appears to be working normally as it relates to automatic withdrawals and automatic bill pay for your accounts. De clutter, organize and file that week’s receipts. File paid bills and other filing that has accumulated during the week. Shred any documents that have accumulated with your Secure Document Shredding Service. Deal with any other documents confidential or otherwise. Adding dates to your calendar, both from papers or emails you’ve received. These tasks deal with paper data but digital data is equally as important to deal with. Responding to emails and other on line services should also be part of your document organisation schedule. It doesn’t matter how big a pile has accumulated, a paperwork session is about good habit forming done regularly each week. Once paper organisation habit has formed, it creates a better management of document life cycle and spot potential data breaches and mistakes in the documents. 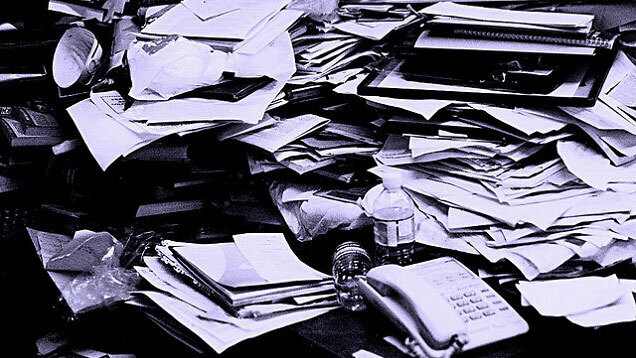 Clutter can be dealt with on you desk and around you. There is also an option of availing of a Clear out Shredding Service. Old or archived documents that no longer serve a purpose that may be in a clutter pile can easily be dealt with by our services. please contact our team today and visit our site. We operate our Confidential Shredding in Dublin, Galway, Limerick and Cork areas and the rest of Ireland. This entry was posted in Confidential Shredding, Data Destruction, Data Protection, Off Site Shredding, Onsite Shredding, Paper Shredding and tagged Confidential Shredding, Data Privacy, Data Protection, Data Security, document shredding, Paper Shredding Ireland, paper shredding service, Secure Shredding by Security in Shredding. Bookmark the permalink.